I, Robot: Paraplegics Get An Assist : Shots - Health News Wearable robots are making walking a reality for paraplegics in rehabilitation centers around the country. But before Iron Man-like suits become mainstream, they'll need to overcome cost and regulatory hurdles. 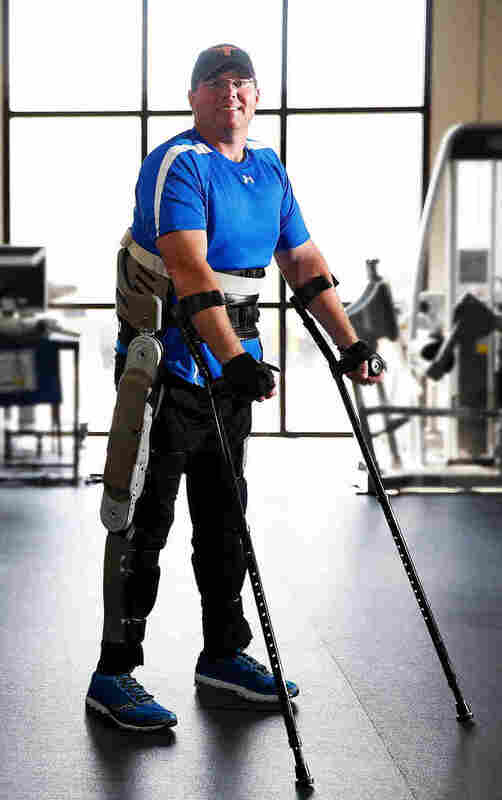 Engineers at Rex Bionics in New Zealand developed an exoskeleton that allows people paralyzed from the waist down to walk again. Unlike other models, the Rex exoskeleton has a joystick control and doesn't require crutches. 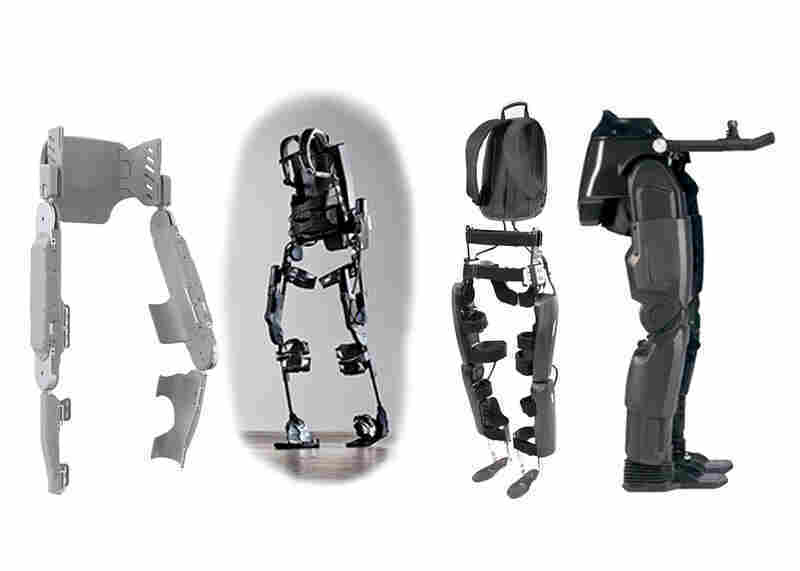 From left to right, the Vanderbilt exoskeleton, the Ekso Bionics exoskeleton, ReWalk by Argo Medical Technologies and Rex by Rex Bionics. Brian Shaffer tests an exoskeleton developed by researchers at Vanderbilt University at a rehabilitation center in Franklin, Tenn. The exoskeleton locks around the legs and feet. To stand up, a paralyzed person simply leans forward. A patient wears the Vanderbilt device in his wheelchair. The Vanderbilt researchers say that it has some advantages over others. It's lighter, breaks into three parts and fits in a small wheelchair. 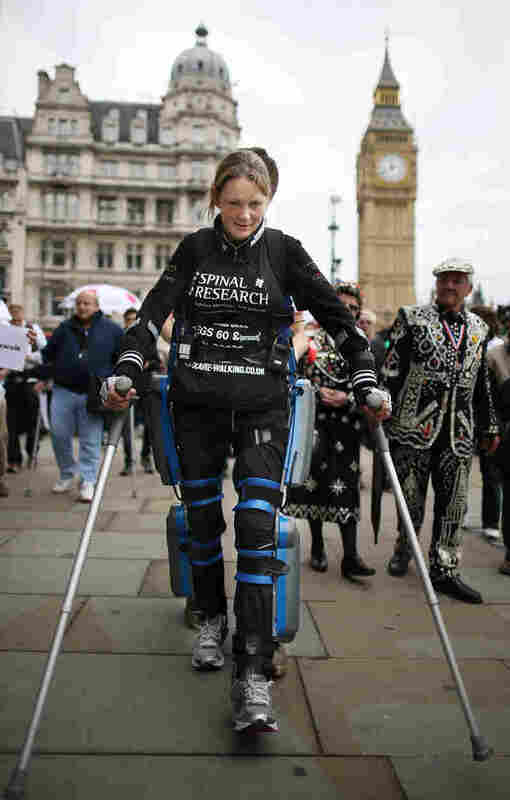 Paralyzed from the waist down, Amanda Boxtel walks with the aid of a bionic exoskeleton in London in 2011. Users learn to walk in the Ekso Bionics device with rehabilitation technicians controlling their steps before walking on their own. Claire Lomas, a paraplegic, walks the last mile of the London Marathon in May 2012. Starting out with 36,000 other runners, she averaged two miles a day with the help of a bionic ReWalk suit by Argo Medical Technologies. Robert Woo and Theresa Hannigan, both paraplegics, complete a one-mile walk in the ReWalk exoskeleton, developed by an Israeli company called Argo Medical Technologies. Argo's devices have been approved for personal use in Europe, but need FDA approval for sale in the U.S.
Steve Holbert (center), a paraplegic, demonstrates NeuroRex, a bionic exoskeleton suit augmented with a neural interface cap, developed by researchers at the University of Houston. Holbert controlled the robot's movements with his thoughts. NASA recently announced the development of an exoskeleton for paraplegic rehabilitation use and astronaut strength training. 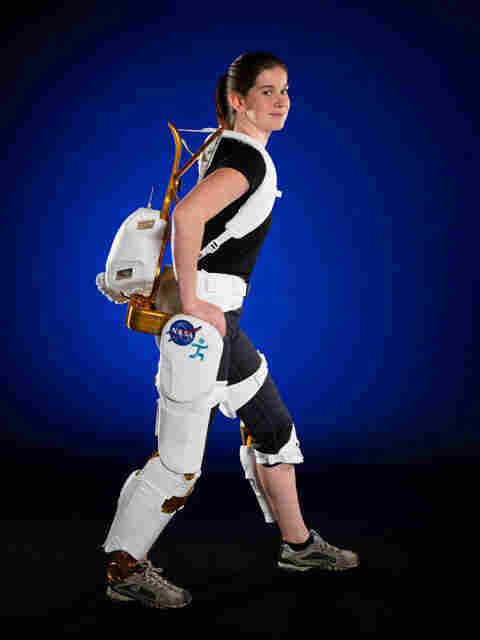 NASA engineer Shelley Rea demonstrates the X1 Robotic Exoskeleton for resistive exercise, rehabilitation and mobility augmentation. A robotic suit that gives the wearer superhuman powers sounds like the stuff of science fiction. But technology like that is making the leap from fantasy to reality. 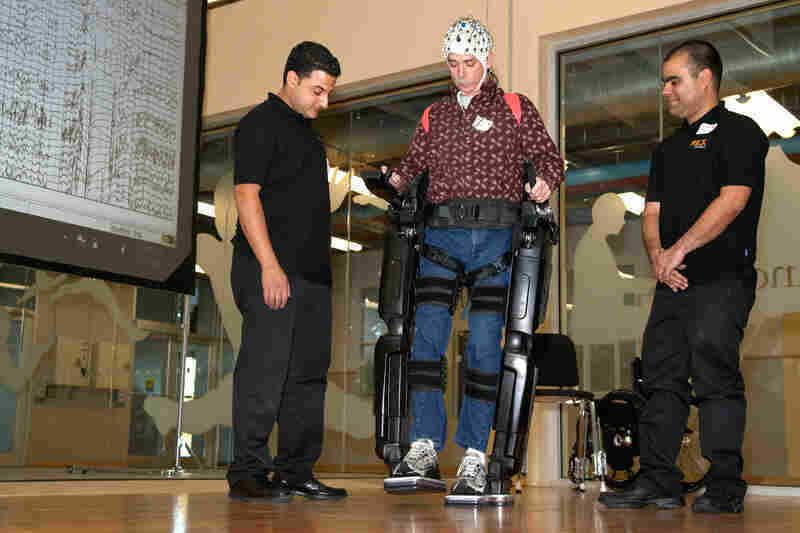 Though much of the gear is still experimental, the equipment is giving some paraplegics a chance to walk again. Researchers at Vanderbilt University in Nashville, Tenn., for instance, have developed a robotic exoskeleton that straps over paralyzed limbs. With crutches, paraplegics can stand, walk and even climb stairs. "It's really a lot like a legged-Segway," says Michael Goldfarb, an engineer at Vanderbilt and head of the exoskeleton project. "You lean forward to walk forward, lean less forward and cause it to stop, lean back and cause it to sit." The researchers have tested the model with patients at the Shepherd Center, an Atlanta hospital that specializes in spinal cord and brain injuries. And the developers have licensed their model to Parker Hannifin Corp., a maker of industrial equipment, which aims to get a product on the market by 2014. Other companies are working on exoskeleton-style devices, too, including Ekso Bionics of Berkeley, Calif., Argo Medical Technologies Ltd. in Israel, and Rex Bionics in New Zealand. The Ekso device and Argo's exoskeleton called ReWalk are only available in rehabilitation centers and hospitals in the U.S. for now. To move wearable robots like these from hospital to home will require approval from the U.S. Food and Drug Administration. And clinical trials to show there are health benefits for the exoskeletons are already under way. "What we really are selling until we have clinical proofs is a gadget," Eythor Bender, Ekso's CEO, tells Shots. A patient walking with the Vanderbilt exoskeleton outside the Shepherd Center in Atlanta, Georgia, in August 2012. "For us it was really important that it was portable, so someone could put it on the back of their wheelchair and take it to the park," says Vanderbilt engineer Michael Goldfarb. The Vanderbilt model is powered by four motors — one at each hip and knee joint — that are controlled by two micro-computers. 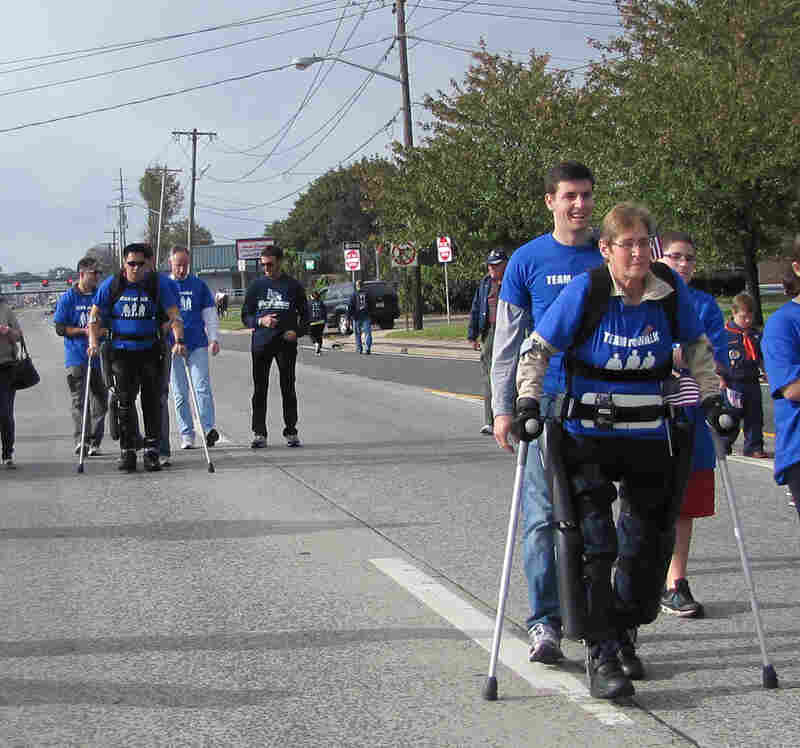 With crutches for balance, users lean forward to stand up and control their steps with hip placement. To take a step with their right foot, they shift their weight onto their right hip. The battery lasts for about two hours of continuous walking. The ReWalk and Ekso devices employ similar but slightly different designs. ReWalk uses a wrist band to control movement, and Ekso includes a control pad to adjust various walking factors. 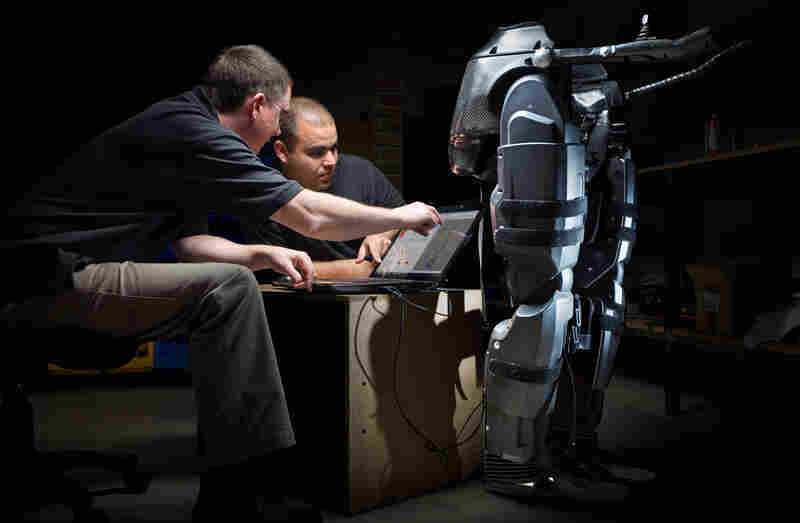 The Rex exoskeleton is heavier (84 pounds), but it stabilizes the body, leaving the hands free. The Vanderbilt device incorporates electrodes that are affixed to the skin and tell a person's muscles when to contract and relax to move the device. When the user's legs get tired, the motors kick in based on an adaptive computer algorithm that Goldfarb's team developed. "It looks at what you did during your last few steps, and it alters from person to person and within a person from day to day and hour to hour," explains Goldfarb. The companies want to take their devices mainstream. But, the prices are high. Ekso's rehab model runs $140,000 plus a $10,000 yearly service fee. 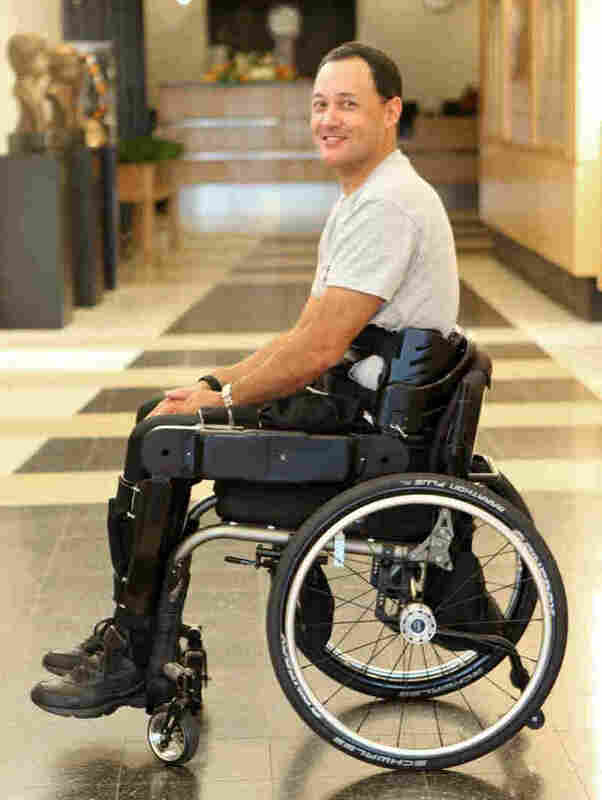 The ReWalk devices costs $87,500. Argo plans to submit a personal version of ReWalk (expected price around $52,500) for FDA clearance by the end of the year. Until the devices receive the regulatory stamp of approval from the FDA, it's unclear how much insurance companies would cover, says Vanderbilt's Goldfarb. Most companies have models for everyday personal use in the works, but none have received FDA's OK yet. "All these systems are designed differently," says Jose Contreras-Vidal, an engineer at the University of Houston in Texas. "We don't know which system is best for whom." 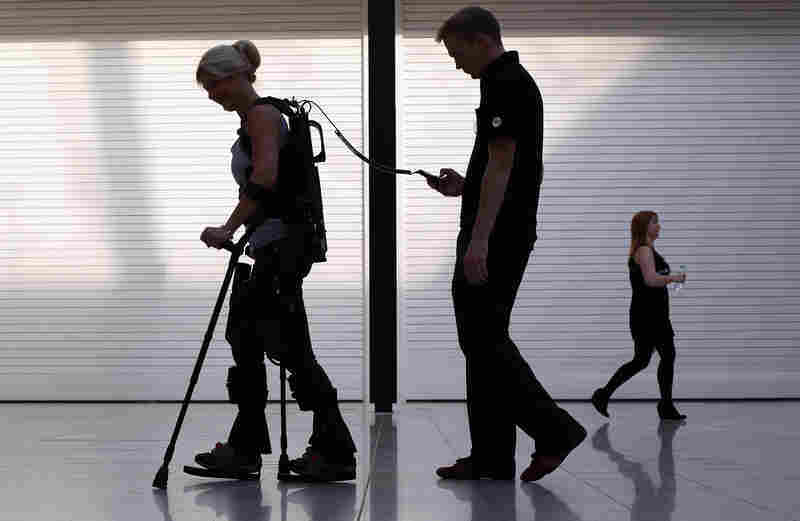 Developers hope to tailor exoskeletons for those suffering from paralysis due to stroke or muscular dystrophy, as well. Regulatory hurdles aside, the next technological step is controlling the robot with the mind. Contreras-Vidal has already developed a cap that measures brain signals and translates them into instructions for the Rex exoskeleton. "By augmenting these exoskeletons, we can reach a larger population," says Contreras-Vidal. "At the same time we can learn more about how the brain works."